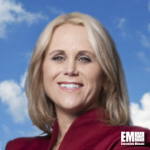 Suzi McBride, formerly chief operations officer and senior vice president at OneWeb, has been named COO of Iridium Communications (Nasdaq: IRDM) effective Feb. 11. She will succeed the retiring Scott Smith, who will continue to work at Iridium in a consulting capacity through March 15 to facilitate the transition, the company said Friday. Smith joined Iridium in April 2010 and helped lead the replacement of the company’s satellite constellation with the Iridium NEXT network and development of satellite-based products and services. “We’re very fortunate to be able to wish Scott a happy retirement with a monumental achievement like Iridium NEXT under his belt, while welcoming someone with Suzi’s experience, expertise and leadership abilities,” said Matt Desch, CEO of Iridium and a 2019 Wash100 recipient. McBride will oversee the Iridium network’s operations, related ground gateways and terminals as well as the development and production of subscriber equipment, new applications and services. McBride is a more than 25-year industry veteran who rejoined Iridium, where she spent nine years during her first tenure and served as VP of program management and launch services. She is a Project Management Institute certified professional and is a former senior engineer at Motorola’s (NYSE: MSI) satellite communications group.